This week, the Senate will turn its attention to the state’s SFY 2017-2018 budget. In doing so, Senators will debate what is commonly known as the "Long Bill" (due to its length) and accompanying bills that will be required to balance the state’s budget. As in years past, CCI expects to see many amendments offered over the course of the week. Very few, however, will actually pass. At the end of the week, the full Senate will vote on next year’s budget and then the House will begin their budget deliberations on Monday, April 3. Throughout this process, CCI will keep a close eye on county budgetary priorities. For more information on a specific bill, click the bill title under the Weekly Bill Summaries at right. For the Master Bill Table on the CCI web site, click here. HB 1123 is enabling legislation that would authorize the board of county commissioners to extend the serving hours at licensed liquor establishments beyond the current 2 am limit. The bill is awaiting a hearing on Second Reading on the Senate floor. HB 1203 states that a county special sales tax on marijuana may be collected countywide, unless a municipality has its own sales tax on marijuana, in which case a county may only collect inside the municipal boundaries through an intergovernmental agreement. This special sales tax authority is distinct from the county general sales tax authority. CCI is working with the bill sponsors to craft a legislative declaration that underscores this distinction. The bill passed the House last week and is now awaiting introduction in the Senate. HB 1220 establishes a statewide residential plant cap, regardless of whether the plants are for medical or recreational use. The bill also establishes civil and criminal penalties for exceeding the plant cap, unless a local plant cap is in existence and permits additional plants. The bill also requires all medical marijuana caregivers and patients who are growing in a residence to comply with all local laws and regulations, including zoning and use restrictions. The bill was amended in the Senate Judiciary Committee last week and then passed unanimously. As amended, it sets the statewide plant cap at 12 plants, but allows caregivers and patients to have up to 24 plants - provided they register with state and local governments and that local plant caps are not more restrictive. The amendments also create definitions of what constitutes a plant in order to assist local law enforcement. CCI has prepared a fact sheet on HB 1220. You can read it here. HB 1221 would establish a new $6 million grant program in the Department of Local Affairs to provide grants to local law enforcement agencies and district attorneys to assist in the investigation and prosecution of illegal marijuana grow operations. The bill passed the Senate Judiciary Committee last week on a unanimous vote and is now awaiting a hearing in the Senate Appropriations Committee. SB 40 makes changes to the Colorado Open Records Act (CORA) by allowing record requestors to request a document in its native format (e.g., an Excel spreadsheet) or a structured data format. While a number of safeguards were added to the bill at CCI’s behest during stakeholder meetings last year, members continue to have concerns about the security of sensitive data (such as social security numbers) that may be recovered from a document transmitted in a native/structured data format. CCI is also concerned that the changes to the bill will only encourage more data mining by out-of-state corporations. CCI has prepared a fact sheet on SB 40. You can read it here. The bill was passed by the Senate this week and now heads to the House. As introduced, SB 192 would have allowed licensed retail and medical marijuana dispensaries to begin making home deliveries around the state, subject to approval by the Marijuana Enforcement Division in the Department of Revenue. The bill was amended substantially in committee to remove marijuana deliveries altogether and instead focus on making the average market rate more responsive to market volatility and make changes in how the state calculates and collects its excise tax on retail marijuana. Counties with a local excise tax on marijuana will continue to collect their excise tax using the average market rate, which will be calculated quarterly (as opposed to twice a year currently) by the Department of Revenue under the bill. CCI believes these changes would benefit rural cultivation operations and are supportive of the proposed changes. The bill is currently awaiting a hearing in the Senate Appropriations Committee. HB 1110 provides procedures for judges to issue an Allocation of Parental Responsibilities (APR) order during a Juvenile Delinquency case when all parties are in agreement. This CCI-initiated bill applies to juveniles who are placed in temporary legal custody with a close relative or friend during a juvenile delinquency case. Once the case closes, the temporary legal custody order goes away and the juvenile may return home, but in some cases, the parent declines to take custody of the juvenile again. Without this order, the juvenile delinquency case is sometimes kept open longer than necessary in order to continue the temporary legal custody arrangement. This bill provides faster permanency for some juveniles and ensures they are in a stable environment to work towards self-sufficiency and becoming a productive member of society. For CCI’s Fact Sheet on HB 1110, click here. HB 1110 passed unanimously out of the Senate Judiciary Committee and was referred to the committee of the whole. HB 1111 provides procedures for the Juvenile Court to enter civil protection orders in Dependency & Neglect (D&N) actions in the same manner as district and county courts. These protection orders, unlike the “no contact” orders currently used in D&N cases, allow for violators to be arrested and can extend past the closing of the D&N case. This CCI-initiated bill better protects children and families, while ensuring adequate due process for offending parties. HB 1111 passed both chambers unanimously and now heads to the Governor’s desk for his signature. CCI thanks Rep. Beckman and Sen. Fields for their outstanding leadership on this bill! HB 1185 adds to the list of mandatory reporters, officials and employees of county departments of health, human services, or social services. This bill also extends the period of time within which the county department of human or social services must report certain information to some mandatory reporters from 30 to 60 days. HB 1185 passed second reading on March 24 with an amendment to extend the implementation date of the bill until the end of the year. However, CCI continues to have concerns about the lack of clarity around the definitions of a county human or social services employee and a county department of health. HB 1207 makes juveniles who are aged 10-12 ineligible for placement in the Department of Youth Corrections (DYC) unless the juvenile has been arrested or adjudicated for a felony or a weapons charge. These juveniles will instead be eligible for other programs and services in the community. Counties have worked with the bill proponents and the Judicial Department on an amendment to ensure juveniles remain in the care and custody of a parent, guardian, or legal custodian whenever possible. This is to address the concern that juveniles would be placed in residential treatment facilities at a higher rate as a result of their ineligibility for DYC. While the bill, as amended by the House sponsor, includes some language to address county concerns, the counties hope to draft stronger language to ensure juveniles stay in their home whenever possible. A stakeholder meeting is scheduled for Wednesday, March 29 to discuss amendment language. HB 1283 creates a task force to identify and encourage collaboration between county-level programs for child welfare caseworker resiliency. Many county human services directors have implemented resiliency programs to address high rates of turnover such as peer-to-peer programs, mentoring, and mental health support. This task force will bring together human services directors, child welfare caseworkers, and other subject matter experts to create a database to provide guidance to county departments who may choose to develop their own program. HB 1283 has been assigned to the House Public Health Care & Human Services Committee. HB 1284 requires certain employers at facilities and programs that serve at-risk adults to request a Colorado Adult Protective Services (CAPS) background check from the Colorado Department of Human Services (CDHS) prior to hiring employees who will provide direct care. The bill also requires county departments to conduct their own CAPS check of adult protective services employees. This check verifies whether a person is substantiated in a case of mistreatment of an at-risk adult. Counties have been involved in working with CDHS on drafting the bill and worked to include several provisions. For example, CDHS will provide training by July 1, 2018 to county departments relating to investigating reports, making findings, notifying a person who has been substantiated, and entering accurate documentation of the report into CAPS. Counties will not be required to provide notice of a finding to a person until CAPS is capable of automatically generating the notice required. Counties are also able to conduct the CAPS check on their own instead of requesting the check by CDHS. SB 16 would make it optional for all counties to establish a child protection team (CPT) in child welfare cases. Currently, 52 counties are required to use CPTs, and it is encouraged but optional for other counties. A 2014 audit questioned the effectiveness and overall value of CPTs to the child welfare system. SB 16 addresses findings in the audit by making CPTs optional for counties and allowing counties to use a risk-based approach to reviewing cases with team members. Click here for CCI’s Fact Sheet on SB 16. SB 16 passed unanimously in both chambers and is heading to the Governor’s desk for his signature. SB 177 amends the Children’s Code definition of “special respondent” to allow a party to be voluntarily joined in a dependency and neglect proceeding. Currently, a party can only be joined involuntarily. This better aligns the definition with its subsequent use throughout the Children’s Code and with current practice. SB 177 passed unanimously out of the House Judiciary Committee and passed on second reading. Food inspection programs that are administered by counties are supported by a mix of state and county general funds and annual license fees that are paid for by retail food establishments. Through the collaborative efforts of many stakeholders, HB16-1401 achieved a long-standing county priority of increasing retail food establishment license and inspection fees over a period of three years. CCI is seeking two modifications to last year’s bill through SB 244. Those are: 1) the removal of the “supplanting language” and 2) allowing counties to reduce fees below their statutorily established cap as long as all statutory performance expectations can be met. SB 244 will be heard in the Business, Labor and Technology Committee on Monday, March 27. For CCI's Fact Sheet on SB 244, click here. As amended, HB 1049 allows interest payments for erroneously levied property taxes to start when an abatement petition is filed, not when taxes are paid. This change eliminates the incentive for taxpayers who might delay in filing for an abatement. It also incents counties to process abatement petitions in a speedy fashion. HB 1049 passed the Senate Finance Committee on March 23 and now awaits second hearing in the Senate. HB 1187 would have referred a proposition to voters at the statewide election on November 7, 2017. Conditional on voter approval of the proposition, the bill would have changed the computation of the excess state revenues cap (Referendum C cap) for FY 2017-2018 and all subsequent fiscal years. HB 1187 was postponed indefinitely in the Senate State Affairs Committee. HB 1216 creates a 12 member task force to study sales and use tax simplification between state and local governments, and in particular between the state and home rule jurisdictions. The task force is subject to sunset review in 3 years and is required to make an annual report to the legislature that may or may not include recommendations for legislation. The task force includes a county representative and is required to meet at least 8 times between July 2017 and November 2017. HB 1216 was approved last week by the House Business Committee and now waits for a hearing before the House Appropriations Committee. As amended, HB 1174 expands the use of local improvement districts to allow rural counties (defined as counties with a population under 60,000) to fund broadband infrastructure improvements and partner with wireline and wireless providers to bring broadband service to unserved communities. The bill was amended and passed in the Senate Local Government Committee last week and is now awaiting a hearing before the full Senate. This bill is a CCI Legislative Priority for 2017. CCI has prepared a fact sheet on HB 1174. You can read it here. HB 1242 is a comprehensive, bipartisan measure to address the state’s transportation funding shortfall. As introduced, the bill would ask voters this November to raise the state sales tax by .62% in order to generate approximately $700 million annually for dedicated transportation needs. $300 million of this new revenue would be used by CDOT to do $3.5 billion in bonding to expedite Tier 1 projects around the state. The remaining $400 million generated annually would be allocated to local governments (to be shared equally between counties and cities) and a new multi-modal transportation grant program. The bill also creates a new commission (with four seats going to local government representatives) to consider and award these multi-modal grants. Finally, the bill reduces the state side of the FASTER surcharges on vehicle registration (saving citizens $75 million annually) and requires a $50 million contribution by CDOT toward the debt service on the bonds. The bill was amended last week in the House Transportation Committee and passed out on an 8-5, party-line vote with several important amendments. 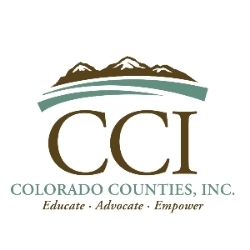 In response to growing concerns about CDOT’s ability to meet their bond repayment obligations, the committee voted to increase the share of the new revenue going to CDOT by $75 million, bringing it up to $375 million. Obviously, this will reduce the share going to local governments and the new multi-modal grant program. The committee also amended the bill to repeal FASTER late fees altogether, which will have an effect on county HUTF revenues. However, this repeal of the late fees will only take place if the ballot measure passes in November. As amended, HB 1242 will be heard this week in House Finance. CCI expects that this compromise funding package will continue to change -- perhaps significantly -- as it goes through the legislative process. CCI will be working closely with the sponsors and other key stakeholders to advocate for an equitable local share to address county transportation needs around the state. CCI staff has prepared a short memorandum on HB 1242. You can read it, click here. SB 213 was also amended to clarify that if a driverless vehicle is unable to comply with state and federal laws, testing may not occur unless approved by the Colorado State Patrol and the Department of Transportation. SB 213 passed the Senate 22-13 and is now headed to the House. Under current law, the solid and hazardous waste commission can reduce the waste tire fee below the statutory level of $1.50. This fee is broken out and distributed to several funds including, waste tire administration, enforcement, cleanup, an end users fund, and the waste tire market development fund. Starting January 2018, the waste tire fee will be reduced to 55 cents and the end users fund and waste tire market development fund will be eliminated. As originally introduced, SB 47 would expand the definition of end user to include a person who uses whole waste tires (when baled) for agricultural purposes and eliminates the January 2018 repeal date of the end users fund and the waste tire market development fund. Additionally, the fee would have been set to not exceed $1.50 until December 31, 2021 and the incrementally drop down to $1.00 by January 1, 2023. However, because the original proposal drove a fiscal cost, the proposal was removed from the table and amended to become an enterprise fund. SB 47 died in the Senate Finance committee on a 3-8 vote. HB 1193 allows wireless providers such as Verizon or Sprint to install on a light pole, traffic signal, light standard or utility pole a small cell facilities that would provide faster, more reliant wireless cell service in areas where cell services is limited due to “concrete canyons” created by large structures such as office buildings. Providers are only able to locate or collocate small cell facilities and small cell networks if all applicable law has been complied with. Initial proposals brought forward by Verizon would have entirely preempted local land use authority. However, following several months of negotiations with proponents and stakeholders including CCI, CML and The Colorado Communications Utilities Alliance (CCUA), telecom providers have agreed that while these small cell facilities and small cell networks are a permitted use within any zone, they must comply with local land use regulations as well as seek approval from the local government before installation. Additionally, the bill would expedite the permitting process for small cell facilities, clarifying that telecom providers area able to submit consolidated applications for approval (a current practice that many local governments already allow) and requiring local governments to complete an application for an existing structure in 90 days and 150 days for new structures (consistent with state law). Local governments and telecom providers may mutually agree that more time may be necessary to process and complete submitted applications. Finally, telecom providers may access rights-of-ways for construction, maintenance, and operation for small cell facilities and small cell networks. Following introduction of HB 1193, Comcast proposed an amendment that would exclude mid-wire micro wireless transmitters from the permitting process. Upon further conversations local government associations and Comcast ultimately agreed that local governments may require a single use right-of-way permit for the installation, maintenance or replacement of micro wireless facilities. While CCI still has concerns about the bill, we are committed to continue to work with the bill sponsor and proponents. Current Colorado Oil and Gas Conservation Commission (COGCC) regulations stipulate that oil and gas facilities must have a setback of at least 1,000-feet from a high occupancy building unit such as a school. HB 1256 would set in statute and change the setback standard for schools only (and not other high occupancy unit buildings as defined in the 100 series of COGCC rules) to be measured 1,000-feet from the school’s property line. This new measurement would only be applied to newly permitted oil and gas facilities and would not be applied to a facility that is permitted before the building of a new school. CCI believes that the lengthy and robust rule making process undertaken at the COGCC included a wide variety of stakeholders and considered several setback options, ultimately agreeing upon the current 1000-foot setback from high occupancy buildings. This process works and continues to work; because of this, any future proposed changes should be submitted to the COGCC so that all stakeholders may have the opportunity to negotiate once again. HB 1256 was passed out of the House Health, Insurance, and Environment committee on a party-line vote. SB 179 extends the repeal date of existing law (HB11-1199) that caps the total cost of fees charged ($500 for residential applications and $1,000 for nonresidential applications) by local governments for installing solar energy devices/panels. Of 70 local governments surveyed, only 26 cities and one county exceeded the $500 fee for residential applications. SB 179 unanimously passed out of the House Finance Committee and now awaits second reading in the House. HB 1070 requires the Center of Excellence within the Department of Public Safety to conduct a study concerning the use of UAS (drones) within state and local government operations that relate to public safety. The bill also creates a pilot program to integrate UAS within state and local government operations. The goal of the study and pilot program is to create a replicable or scalable UAS module that could be implemented in any part of the State. HB 1070 passed unanimously in the Senate Agriculture, Natural Resources, and Energy Committee. HB 1215 encourages each sheriff’s office and municipal police department to adopt a policy to provide on-scene services to support officers’ handling of persons with mental health disorders and counseling services to officers to the extent practicable. The bill creates a grant program through the Department of Local Affairs to provide grants to sheriff’s offices and police departments. The fund consists of gifts, grants, and donations and any other money that the General Assembly appropriates. The grant program expires September 1, 2027. HB 1215 passed 50-14-1 out of the House and has been introduced in the Senate and assigned to the Local Government Committee. SB 207 removes language from existing law in order to end the use of jails and correctional facilities as placement options for individuals placed on emergency mental health holds if they have not also been charged with a crime. Instead, the bill requires that all walk-in centers throughout the state must be adequately prepared and staffed to accept an individual in need of an emergency mental health hold by January 1, 2018. The bill also enhances the coordinated behavioral health crisis response system to better serve individuals experiencing a behavioral health crisis. The bill authorizes the use of Marijuana Tax Cash Funds for these purposes. SB 207 passed unanimously out of the Senate Judiciary Committee. Earlier this month, CCI wrote a letter to the Joint Budget Committee to support two budget requests related to strengthening the crisis response system. To view the letter, click here. SB 221 indefinitely continues the Court Security Cash Fund Commission by removing statutory sunset language. The Court Security Cash Fund provides supplemental funding for courthouse security through grants for staffing, equipment, and training. The fund is made up of a $5 surcharge assessed on certain court cases. Over the course of the last ten years, the commission has awarded funding to 56 of 64 counties. SB 221 passed unanimously out of the Senate State, Veterans, & Military Affairs Committee.